Startup Funding 2.0 is about innovation in early stage finance. +Rise of the Platforms: how perk- and equity-based crowdfunding platforms are changing the game. +March of the Young Turks: how hot new seed funds are innovating the venture model. Our rockstar speaker list includes Gil Penchina (leader of the largest AngelList Syndicate), Satya Patel (VC at Homebrew), Ash Fontana (Product at AngelList), Ryan Caldbeck (CEO of CircleUp),Boris Wertz (VC at Version One), Ann Miura-Ko (VC at Floodgate) and more TBA. Register soon-- tickets are limited, and prices are going up. This event will sell out. Produced by Foundersuite.com, and hosted by Automattic. Sponsored by BootStrap Labs, Founders Network, and Bizzabo. I have been a point and click admin/consultant in Salesforce for about 5 years (and working in SaaS for more than 10 years with QuickBase), but I haven't been interested in coding since earlier in my career -- I mostly configure. Well, just as I was feeling like I would steer clear of coding (forever), I started reading Salesforce Community BLOGs regarding learning to code this summer with David Liu (a Salesforce MVP and Salesforce architect at Google). It has sparked a new interest in me to dig a bit deeper and get more technical. The thing I have enjoyed, (so far, I have reviewed his website www.sfdc99.com and listened in on the first webinar), is the ease in how the subject is presented. 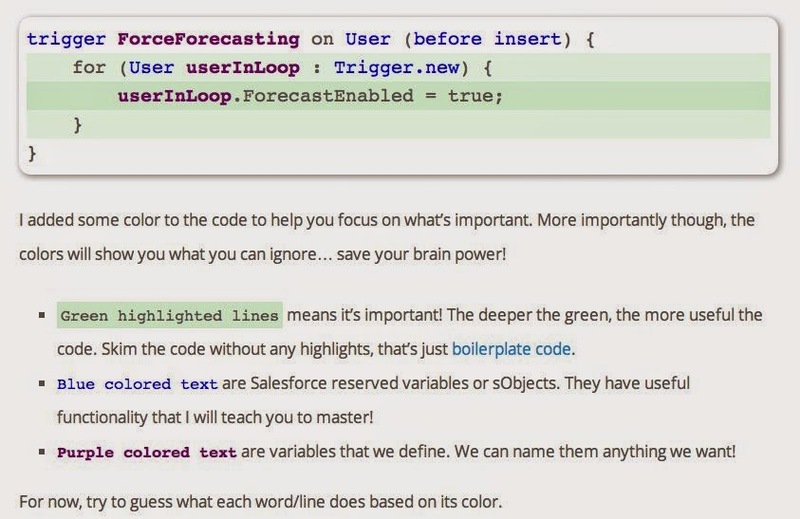 Here's a screen shot, that in a colorful way, explains the nomenclature that makes up basic code in Salesforce. If you're interested, I strongly recommend visiting David's site and checking out the two remaining webinars in the series. "fill-in the blank" system. On our continued theme (last article was on selecting a proper app platform), of helping businesses get from point A to point B, its good to get very clear on where you are (point A) and where you're going (point B) and also your budget for this journey (by Uber X or TownCar). We built a deck to help companies select the correct web-based software for their business. 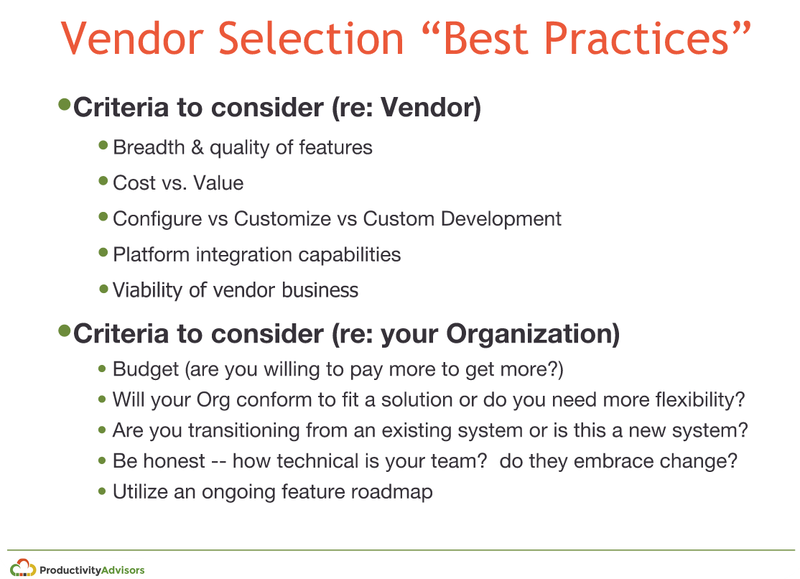 Embedded in the deck is the following slide, which highlights some (but not all) of the questions a business must answer, when choosing between software solutions. 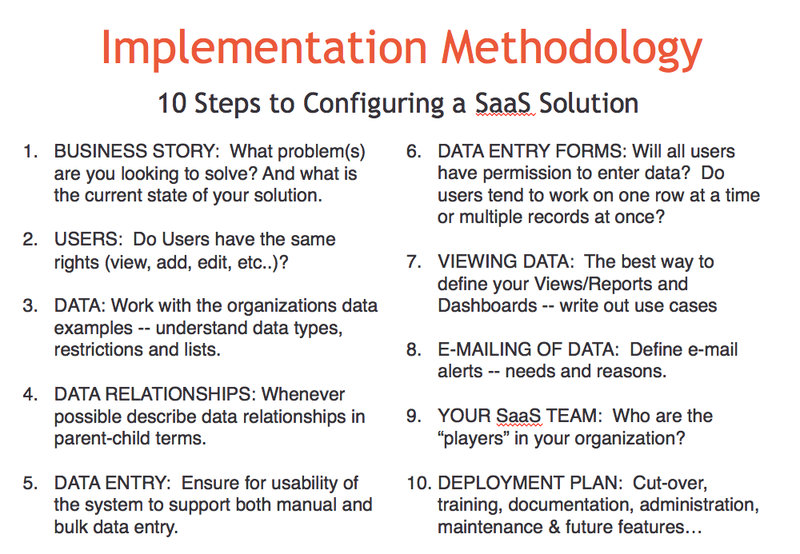 Additionally, we have used the following 10 steps to help clients both assess their vendor selection choice and address the software configuration process.